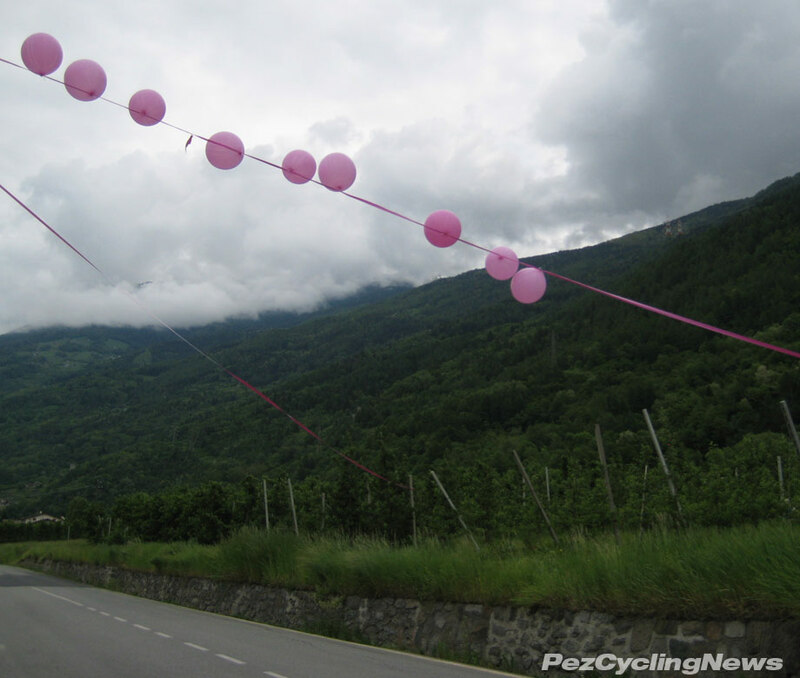 The 2019 Giro d'Italia once again tackles the rightly fearsome Passo Mortirolo, on the Queen stage of 226km after scaling in the massive Passo Gavia, and before a stinger in the tail with the climb back to Ponte di Legno. 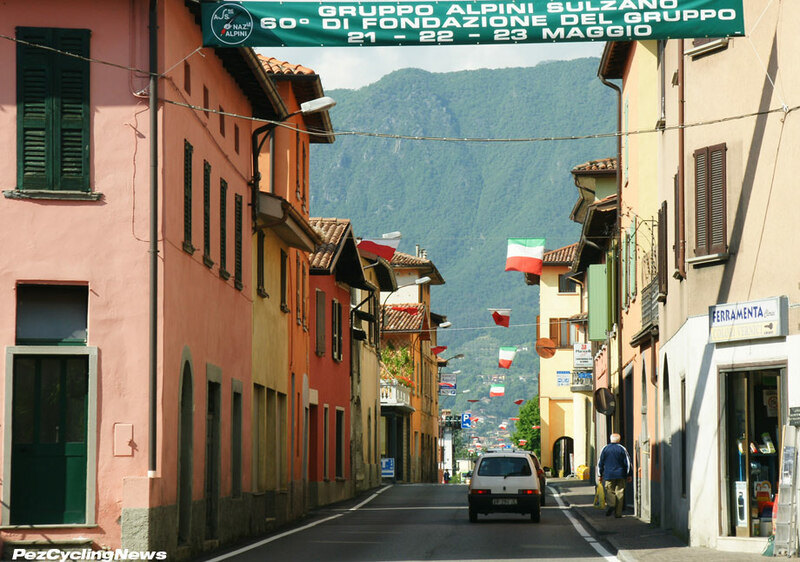 The region is known for epic days - Andy Hampsten won here in a blizzard in 1988, and Marco Pantani drop kicked his way to stardom here in 1994. 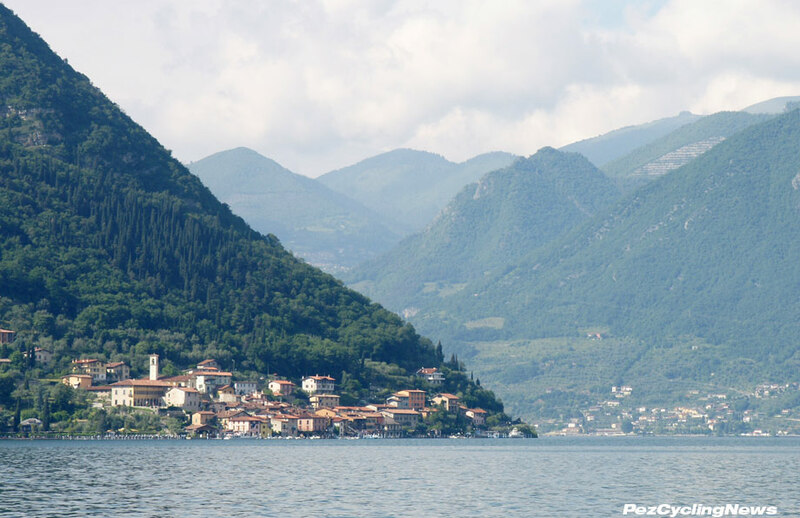 A ride by Lago d’Iseo – nice way to start the day. 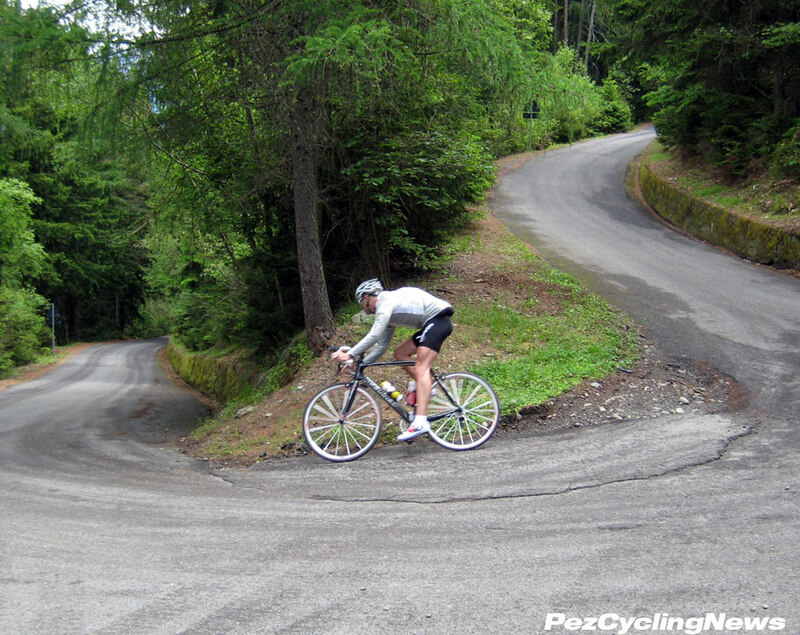 My own encounters with these climbs have been somewhat less spectacular - but no less memorable - as I've ridden here several times in good weather and bad. 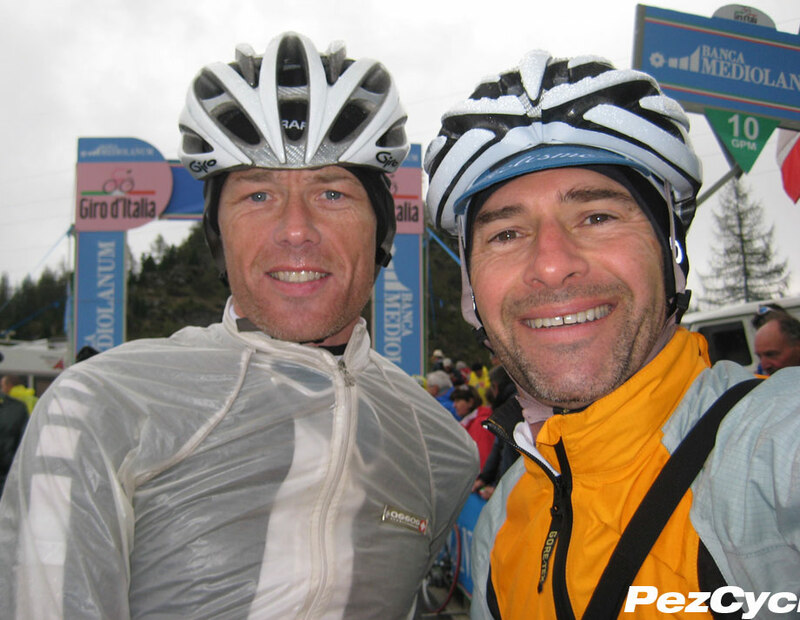 One of my best days on the bike was riding ahead of the stage 19 in 2010 - when I was joined by two "never met each other before" PEZ-fans for a day that took us from Edolo to Aprica, over the Trivigno and then the Mortirolo. I’m back on the race to bring us home through the final three days as the race tackles two gruelling days in the high mountains around Aprica and Bormio, and wrapping with Sunday’s TT in Verona. Although tomorrow looks like the Queen stage – on paper – the threat of a Gavia closure due to snow a-plenty up top and tomorrow’s crap forecast, could easily render today as the premiere epic day of the race. 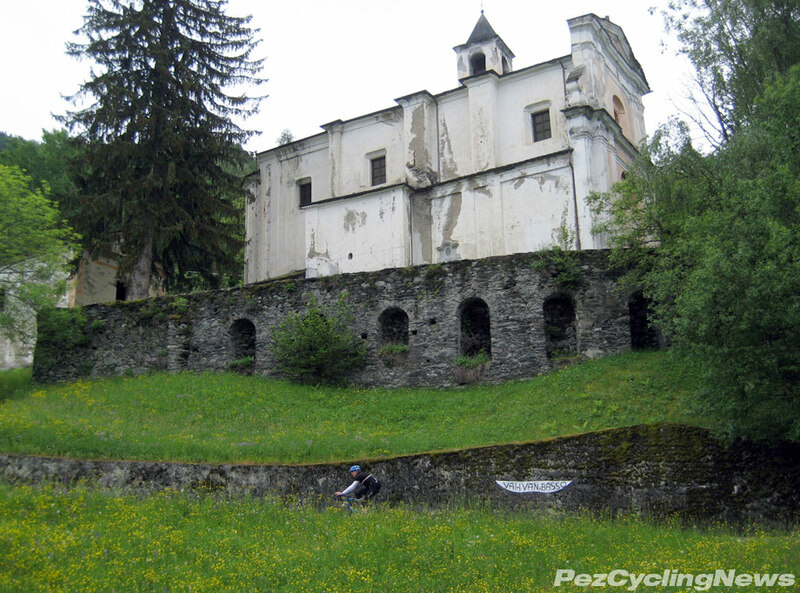 Here’s the stats – 195km from Brescia to Aprica. 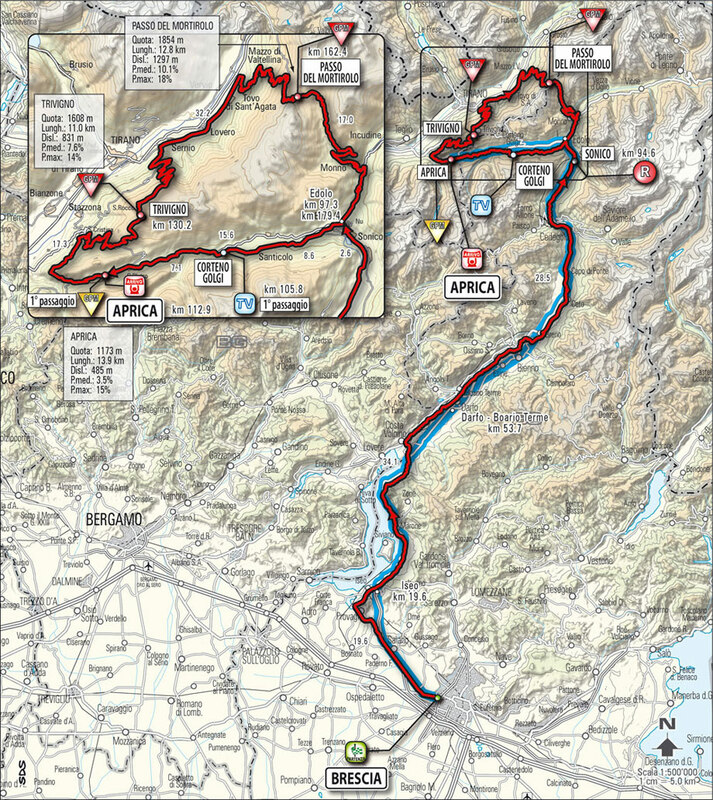 The first 100km are pretty nice – rolling quietly up past Lago d’Iseo and north through the picturesque val Camonica – bordered by ever growing mountains as the altitude gradually increases – until that left turn at Edolo, where begins 95km of “I’m glad I’m being paid for this” type of pro racing with 2 brutal climbs including the feared 12km long Mortirolo with its 7.5 km middle section 11.6% average grade, and intermittent pitches to 18%. Let’s just say this still ranks as the hardest climb I’ve ever hauled my carcass over. But the obstacles don’t stop there. Fresh out of Edolo, they switched up the corsa from years past, to include a few hundred meters that maxes at 15% - to act as a cold-towel snap before the real climbs begin. The climb to Aprica gains 500 meters, mostly at 3-4%, but using it as our warm up today, it rounded out as an hour of leg work I’d be feeling later. 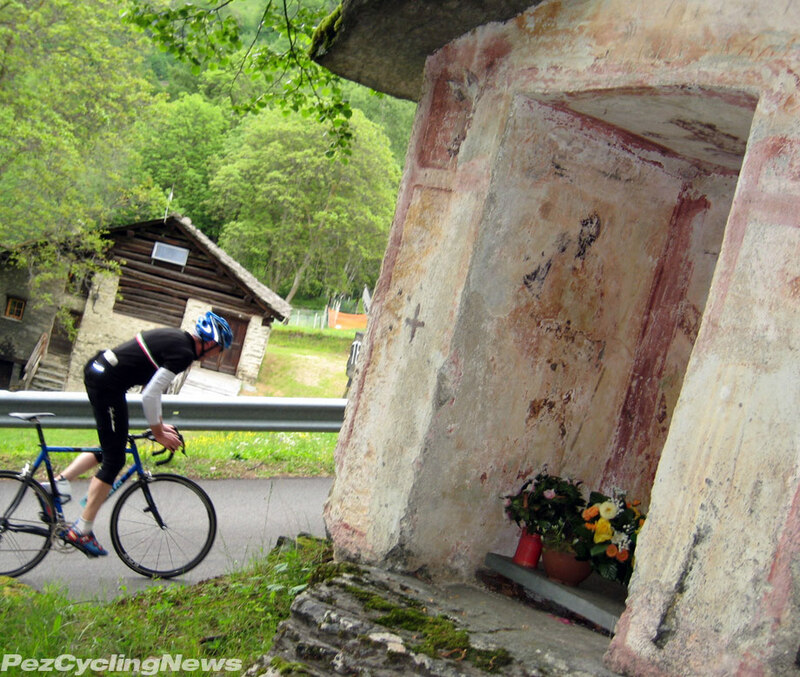 Edolo is a beautiful Alpine town - and a good base for accessing climbs like the Gavia, Mortirolo and more. 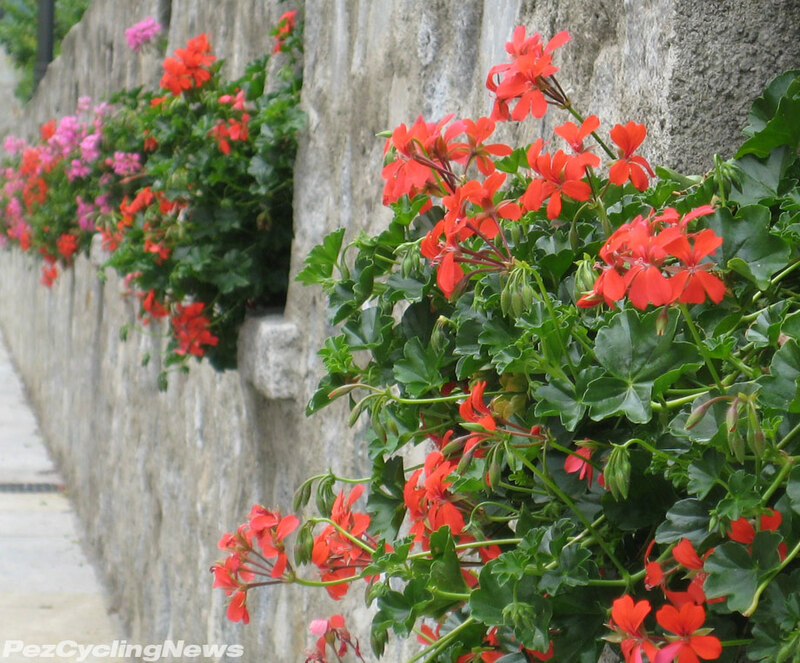 Then comes the nasty little – nay, medium sized climb to Trivigno – which gains 800 meters over about 12km – with a 7km starter of 9.3% average grade. I can attest this sucker hurts and does some real damage to the muscles well before you even approach the Mortirolo. My riding partners for the day were recently deputized Pez-Contributer Steve Holmes, and Danish PEZ-Fan Jan Tufte – who literally drove all night from Denmark to get here – which included a 3 hours nap in his car somewhere near Munich, and an arrival in Edolo just in time for breakfast. Like all true PEZ-Fans, Jan loves to ride, so regardless of his ill-advised prep for today’s jaunt, he was dressed and ready at our appointed meeting time of 9AM in the main piazza. The coolest part of today’s posse, was that except for emails, none of us had met until now. Let’s roll. 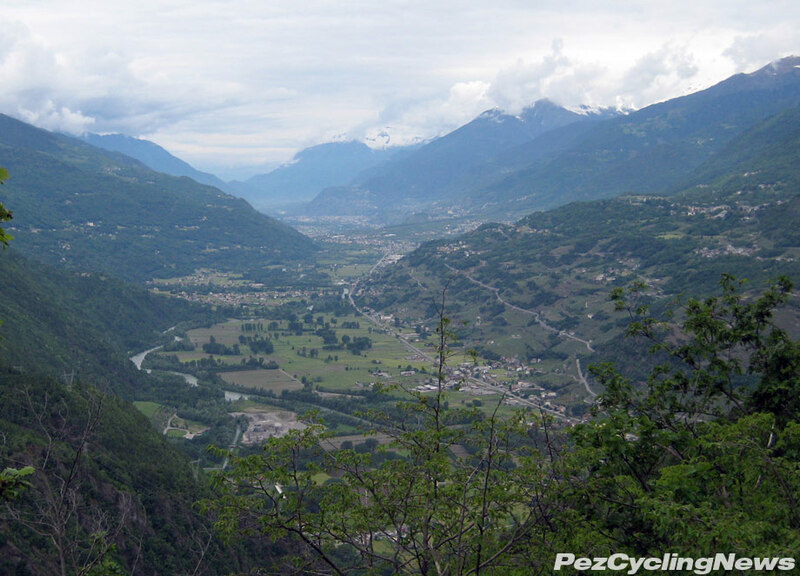 The view towards Sondrio at the tip of the descent from Aprica. There’s something about pushing yourself to an extreme physical limit that certainly does enhance the living experience. And it’s made even better when that suffering takes place on the same roads as the sport we love – and even better again when it’s just hours ahead of the race. Like I said… let’s roll. 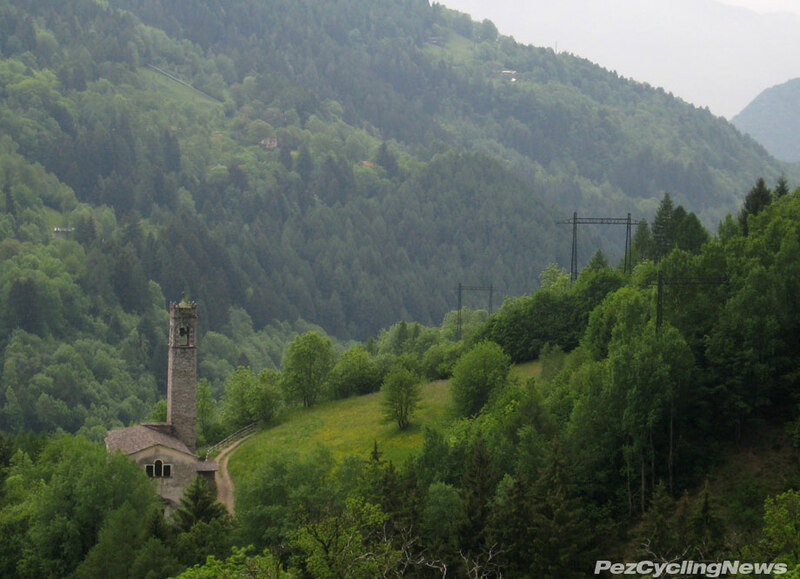 The Trivigno climb offers up a few nice views – but not enough to distract from the gradient. 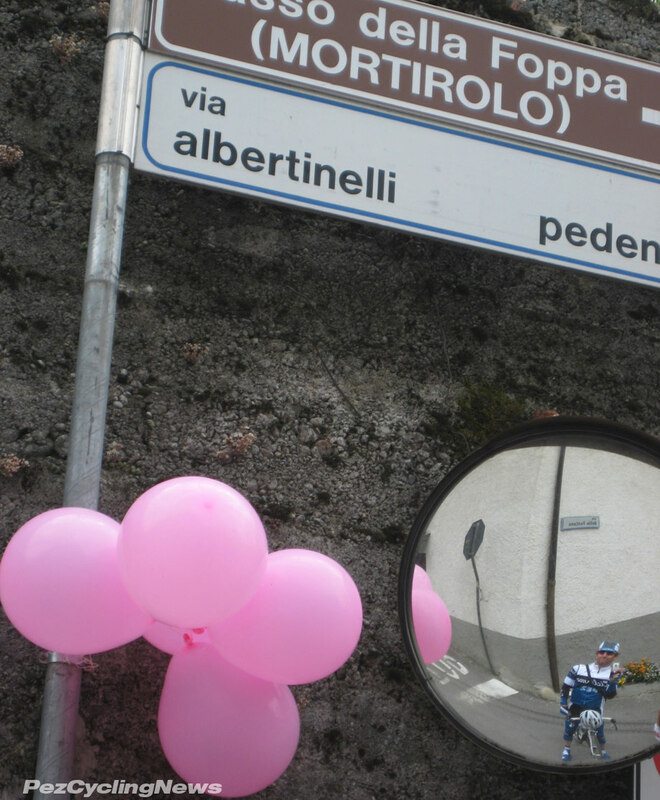 The Trivigno climb starts without much fanfare - you’d miss the tiny entrance if it wasn’t marked with pink Giro corsa signs and a couple of local carabinieri cars with lights blinking. But the pitch is immediate and unrelenting… up up you go, while down down you shift. It’s not the most picture-esque climb – much of it in thick forest, but there are a couple of vantage points worth stopping for that archival photo-opp. … and don’t forget to chain-up. Don’t get me wrong – it’s a nice climb – but I’d say with more appeal to guys who just love climbing. 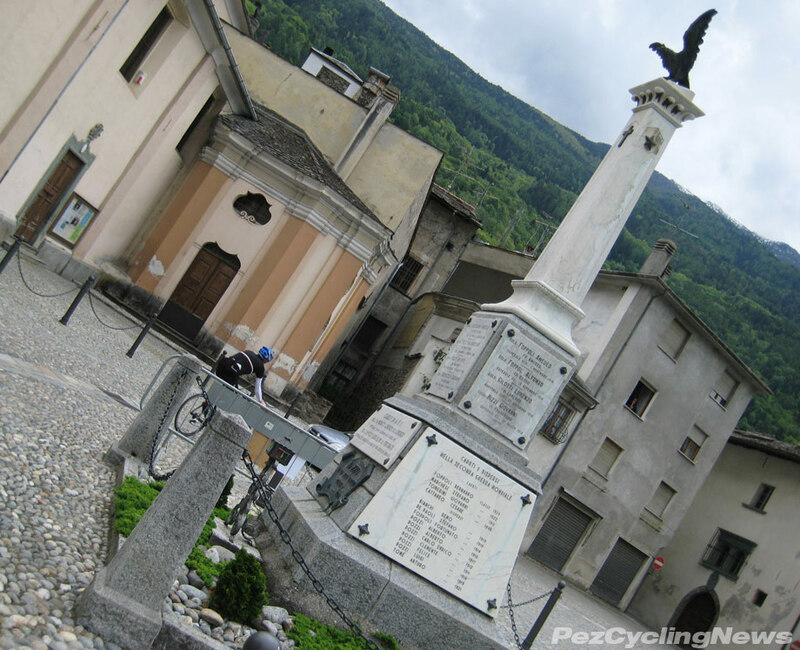 After suffering over the Mortirolo in 2006 on an epic ride that began with a climb over the Gavia, I’ll admit that I was not completely without fear at the thought of returning one day for more torture. My fate was sealed when this year’s course guide was published. 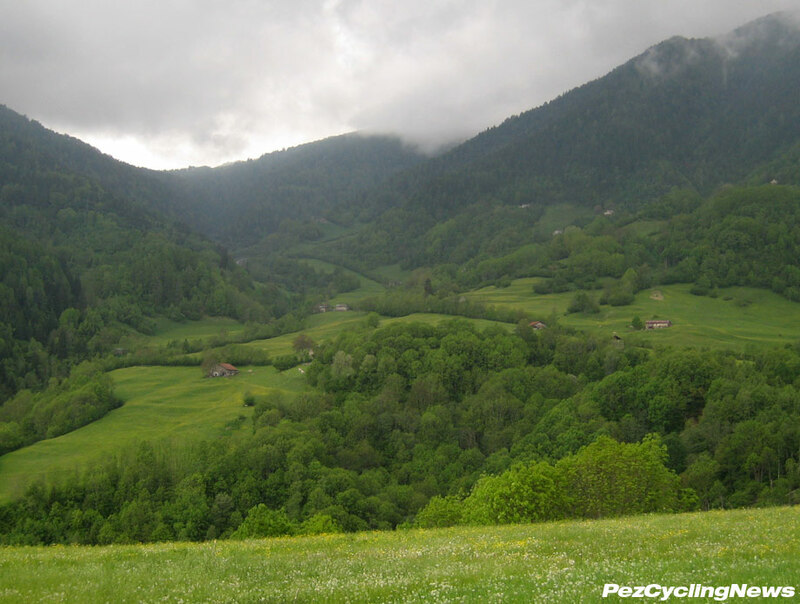 This is a great area for cycling in the ‘scalatore’ style, so regardless of the clear and present pain, my return was fuelled with vigor and anticipation. 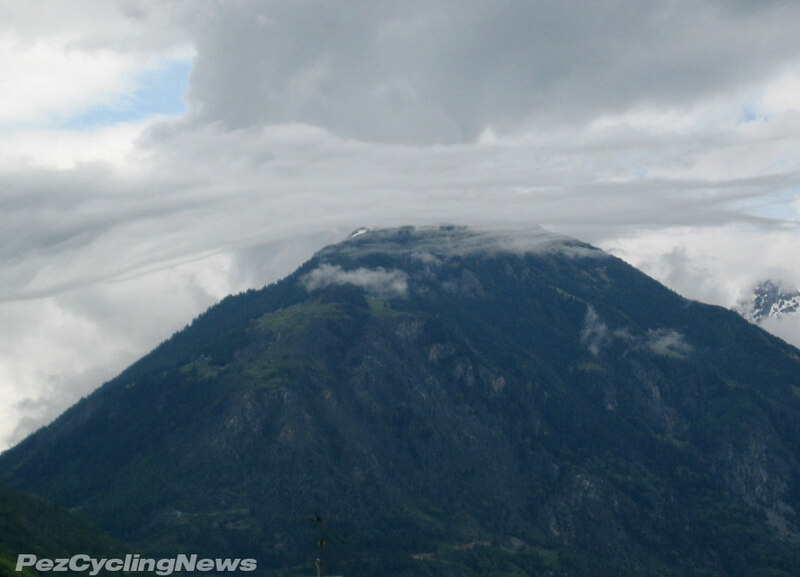 The Mortirolo doesn’t look so bad from down here… but what’s up with those clouds? 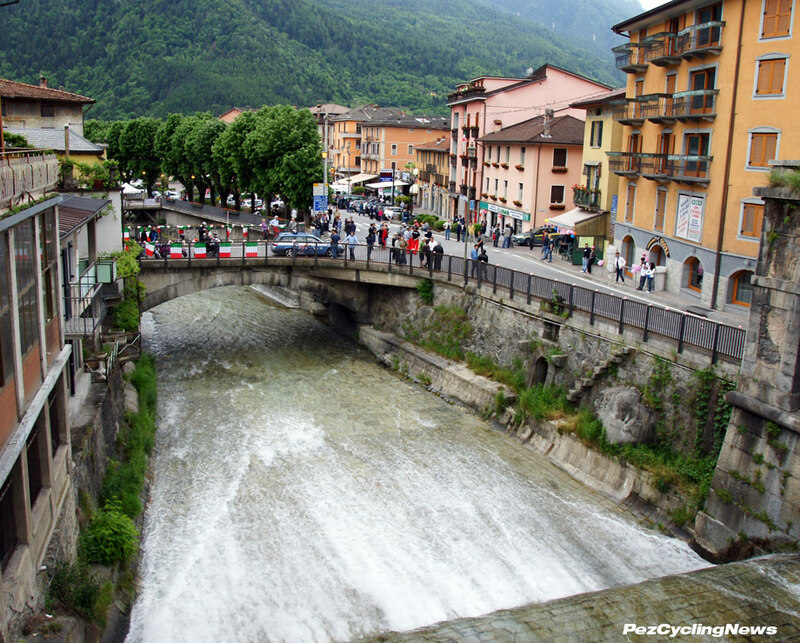 Let’s review: Mortirolo length: 12.8km, Gain: 1317m, Avg grade: 10.3%, max 18%. 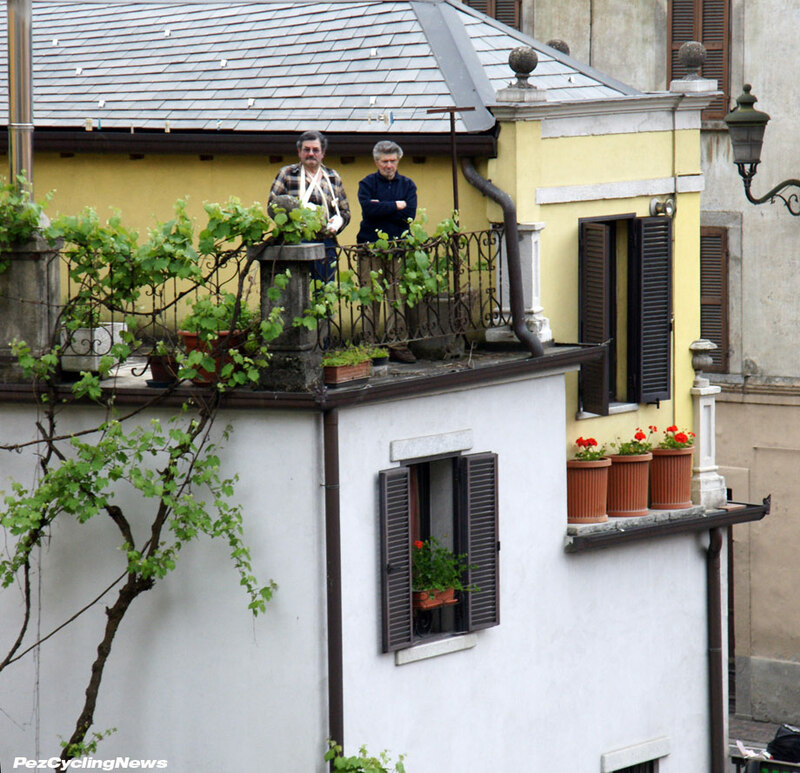 And what's going on up there – just across the valley? In some ways, my first ride over this beast was the toughest. In other ways, I found myself slowly turning gears through a hurt-locker than lasted well over an hour (but less than two), and included a serious reacquaintance with skills developed in my first-ever job as a paper-boy. Yes - I’ll admit the ol’ ‘paper-boy weave' was used by moi for several kms in the middle of the climb, but I’ll also attest that my technique proved faster than many of the riders I passed. Enough stalling, let’s get on with it. The weather in ’06 was hot – maybe 35C degrees on the slopes, with a humidity steamed by recent rains that just made for a one-step from hell kind of day. Today however, was considerably cooler- somewhere in the high teens – and I’m certain this played to my favor. At least until I got somewhere inside the 4km to go mark and the rain drops came. Lightly at first, but I was already feeling the chill as I climbed past 1500 meters altitude. The rain jacket and headband were quickly donned, and amazingly it was with renewed enthusiasm that I attacked the 1000m between km3 and km2. By this time I was open to whatever motivation I could find to get me to the top. There are a few of these shrines for any required prayer. 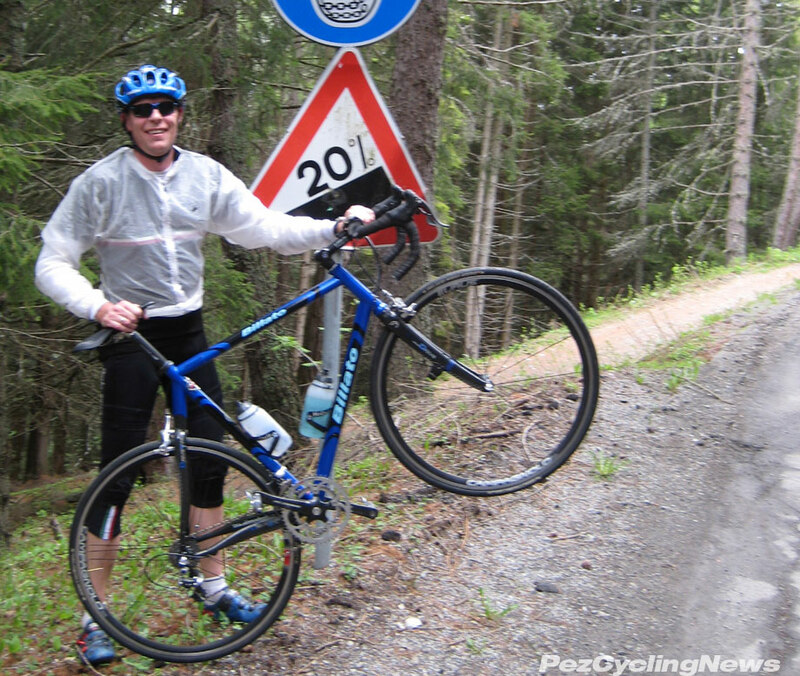 And sure enough the rain came and stayed – over the top and well down the fast, technical descent that drops the 12km off the back to the road back to Aprica. It’s easier to see how tough a climb looks when the riders are going up, but we often miss how difficult the descents are on these Giro corse… Much of today’s roads had been layed with fresh tarmac overnight, which is smooth – and not without some oil. The roads are narrow, and cambers uneven. Then of course you’re trying to go as fast as you can to get down. They’ve placed these numbered signs at every turn – they start at the bottom with No. 30. 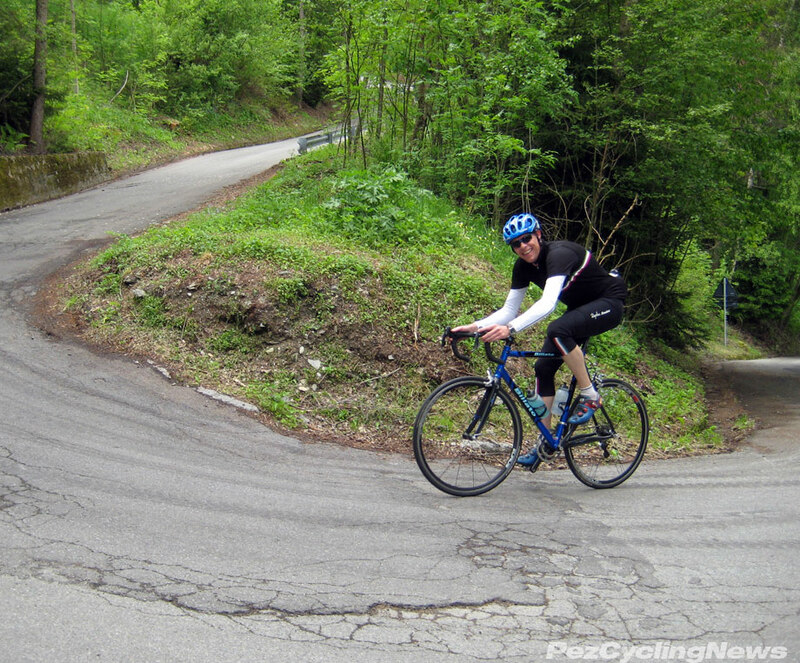 The descent off the Trivogno was especially hairy in many sections, and that was dry. Splash on some water, and you’ve got a whole new way to appreciate how tough bike racing can be. Today’s tv coverage showed both Evans and Vinokourov in trouble on a couple of turns coming off the Mortirolo – and I’m surprised we didn’t see more of that. And here’s that "just reunited with my riding buddy after a hour's worth of pain" look. 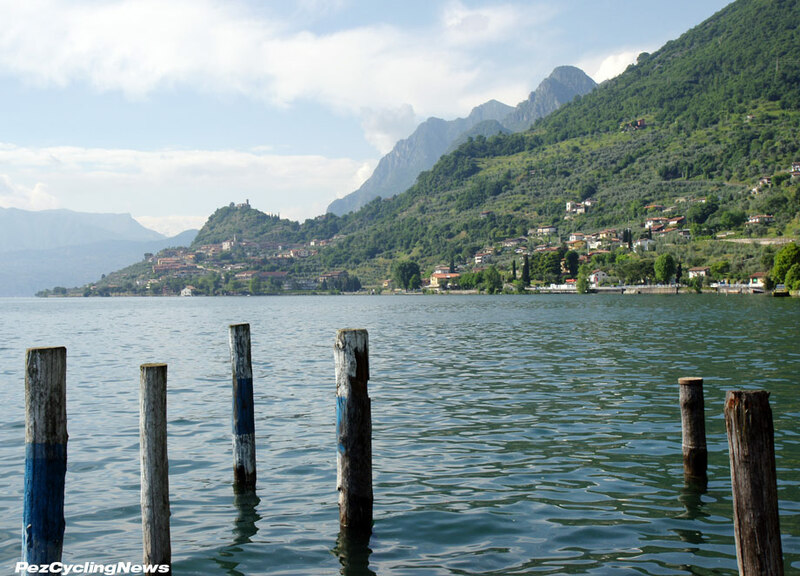 But safely back in my room at Albergo Angelo after a hot bath, a cold beer, and a slice of pizza – with muscles, joints and bones aching from my day – I couldn't help but savour the sensations and memories that made this another ride of a lifetime. Tomorrow’s weather could mean a formulation of “Plan B” – but that’s best left for a negroni that I’m quite sure is in my near future.